WASHINGTON — Vice President Mike Pence has sworn in Alex Acosta as the nation’s new labor secretary, filling out President Donald Trump’s Cabinet as he approaches his 100th day in office. The oath-taking Friday comes after the Senate’s 60-38 confirmation vote in which eight Democrats and one independent joined Republicans in voting yes. “It is about finding and helping and supporting jobs and job growth,” Acosta said as his family looked on. Acosta, the son of Cuban immigrants, is the nation’s 27th labor secretary, leading a sprawling agency that enforces more than 180 federal laws covering about 10 million employers and 125 million workers. Acosta has been a federal prosecutor, a civil rights chief at the Justice Department and a member of the National Labor Relations Board. He arrives at the top Labor post with relatively little clear record on some of the key pocketbook issues facing the administration, such as whether to expand the pool of American workers eligible for overtime pay. Acosta’s ascension comes at a key moment for Trump, just two days before he reaches the symbolic, 100-day marker. The White House has sought to cross the threshold with its own list of Trump’s accomplishments. 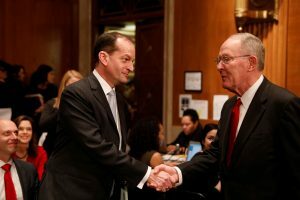 From the beginning, Acosta’s was a quiet march to confirmation that stood out because it didn’t attract the deep partisan battles faced by some of Trump’s other nominees, including Education Secretary Betsy DeVos and Secretary of State Rex Tillerson. Justice Neil Gorsuch’s nomination provoked such a fight that majority Senate Republicans used the “nuclear option” to remove the 60-vote filibuster barrier for Supreme Court picks.